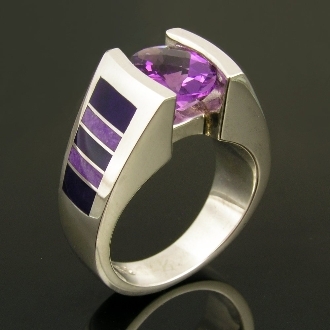 Our Products >> Sterling silver Amethyst ring inlaid with sugilite. Silver earrings inlaid with sugilite, opal and chrysoprase. Handmade sterling silver woman's ring featuring a 1.77 carat oval cut Amethyst accented by inlaid lavender and purple sugilite by jewelry artist Mark Hileman. Ring measures 10mm at the top and tapers to 4mm at the shank and is a size 6 3/4. This ring is available in other ring sizes and stone colors by special order. Amethyst boasts the color of royalty, a rich violet-purple and is the most highly prized variety of quartz. Amethyst is cleansing, both physically and psychologically. It helps promote internal balance, harmony and stability. Amethyst also helps sharpen the conscious mind and enhances one?s mental powers. It is used to improve memory and keeps thoughts in line with life goals. Amethyst is the stone of pure, true, emotional love. Sugilite is named for the Japanese geologist who discovered the first specimens in 1944, Ken-ichi Sugi. The location of the first discovery was the Iwagi Islet in Southwestern Japan. The original Japanese sugilite samples were just tiny, yellow crystals with no gem value. In 1975, the only known deposit of gem grade sugilite was found in the Wessel Mine in the Kalahari Desert near Hotazel in Kuruman, Republic of South Africa. At first it was thought to be a very small sugilite deposit, but later found to be a commercial sized deposit estimated to contain as much as ten to twenty tons located 3,200 feet below the surface. Sugilite commands a high price for an opaque gem material, due in part to the difficulty of removing it from such a great depth. Sugilite often contains black matrix, reddish brown or yellowish blotches. Some of the lesser grades have very light purple to white areas. Opaque bright purple stones with little matrixing or blotches are the highly valued. While almost all sugilite is opaque, a very small percentage, perhaps 1/10 of 1% is translucent. Due to it's rarity and mesmerizing beauty, this gem grade commands the highest prices. At it's peak, stones of this quality climbed to as high as $1000 per carat. Sugilite ranges between 6 - 7.5 on the Moh's scale of hardness. Sugilite is also known under the trade names of "Royal Lavulite" and "Royal Azel". It is thought that sugilite strengthens the heart and promotes physical healing as well as reducing stress by balancing the mind, body and spirit. Sugilite seems to protect against and dissipate anger and other negative energies by encouraging peace of mind, a general feeling of well being and spiritual love.